Over the years, various poets have paid tribute to Andrew and his work by dedicating poems to him. Among them are the eminent Australian poets Les Murray, Shane McCauley and Peter Kocan. Click here to view their poems. Andrew’s fantasy novel, The Red Dragon, has won the Hoffman Award, which is part of the West Australian Young Readers Book Award (WAYRBA). The Hoffman Award is given to the highest ranked Australian/Western Australian book on the young readers’ list. This year, thanks to the “terrific” votes of West Australian young readers, the Hoffman Award has been given to The Red Dragon! Andrew accepted the award in person, and gave a reading from The Red Dragon, at the WAYRBA Awards Presentation Night at the Subiaco Theatre on Friday 24th October. The Red Dragon is published by Omnibus Books/Scholastic Australia and is the third novel in the Chronicles of Klarin trilogy. The other novels are With My Knife and Dragonfox. The respected Western Australian poet, Andrew Burke, has published Andrew’s poem, “Finishing Up” on his website, Hi Spirits. Andrew (Lansdown!) has written some background comments to accompany the poem. Zest, the online magazine of the Australian Poetry Centre, has published an article by Andrew titled “Reading and Reflecting on Haiku”. 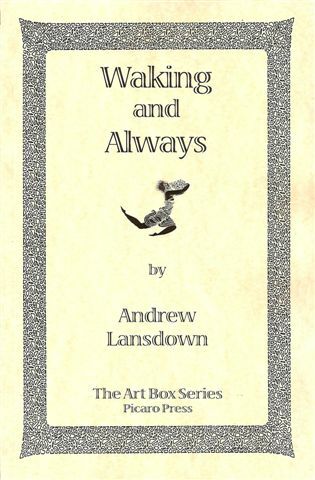 Picaro Press has just released the new edition of Andrew’s 1987 poetry collection, Waking and Always. The new edition of Waking and Always can be ordered through this website (download an order form) or through the publisher’s website at: www.picaropress.com. RRP $15.00. The Weekend Australian newspaper published Andrew’s haiku sequence, “Mosquito Haiku”, in its “Review” pages on 26-27 July 2008. Five of Andrew’s poems and two of his stories have been included in the newly released anthology, Grow: Under the Southern Cross, edited by Lyn Hurry and Anne Hamilton, with illustrations by Rowena Evans. The anthology contains poems, stories and activities for children and young teenagers by various Australian and New Zealand writers. It is especially suited for classroom and homeschool use. The book also comes with a CD that contains readings of ten poems and eight stories. One of Andrew’s poems and one of his stories are included on the CD. Copies of Grow: Under the Southern Cross can be purchased for $29.95 from Writerlynks GROW Magazine, P.O. Box 603, Kenmore, Qld 4069. For further information, email growmag@bigpond.com. ABC Radio National recently broacast a two-part series on “Australian Haiku”. Described as “A detailed exploration of this burgeoning poetic form with some of Australia’s leading practitioners”, the series was produced by Ron Sims for Radio National’s Poetica program. Twenty-six of Andrew’s haiku, along with excerpts of an interview he did with Ron Simms, were included in the series. “Australian Haiku – Part 1″ was broadcast on Saturday 21 June and again on Thursday 26 June. “Australian Haiku – Part 2″ was broacast on Saturday 28 June and again on Thursday 3 July. Both parts of “Australian Haiku” can be heard on the ABC’s website at: http://www.abc.net.au/rn/poetica/. Andrew’s fantasy novel, With My Knife, has gone into an eighth print run. Omnibus Books (an imprint of Scholastic Australia) reissued the book at the end of May 2008. With My Knife is the first novel in the trilogy, The Chronicles of Klarin. The other two novels (which have also gone into additional print runs) are: Dragonfox and The Red Dragon. Picaro Press has undertaken to published a new edition of Andrew’s 1987 poetry collection, Waking and Always. Apart from minor revisions to several poems, the new edition will be the same in content as the original edition. The new edition of Waking and Always will be published in Picaro Press’s Art Box Series. Advance orders for Waking and Always can be placed through this website (download an order form) or through the publisher’s website at: www.picaropress.com. RRP $15.00. Andrew was invited to address the Society of Women Writers (WA) in Perth on Tuesday 20th May 2008. He spoke about his writings and read from The Dispossessed, Fontanelle, Between Glances and Waking and Always. Andrew is among 12 leading Western Australian poets to have his work represented on large free-standing panels by the City of South Perth in its new Poetry Park. The impetus for the Poetry Park came from Dr Ken Spillman, who conceived of it as a way to acknowledge and acclaim the work of Western Austalian poets. The dozen poets whose work was chosen for the panels lining the “Walk of Honour” in the park are all winners of the WA Premier’s Book Awards. Andrew won the Award in 1982 and 1985. Situated in the Neil McDougal Park, Como, the Poetry Park was opened by the Mayor of the City of South Perth on Thursday 15th May 2008.
up the grey trunk of a river gum. The tree leans toward the water. A duck floats on its reflection. inspects it then paddles away. all creatures simply are happy. No duck ends the day with regret. Other. And we alone fall short. Click here to view/download a pdf of the full-size panel bearing the poem. as a distraction from pain.